Lugt,S. van der. 2014. China-Africa: An evolving relationship but invariable principles. 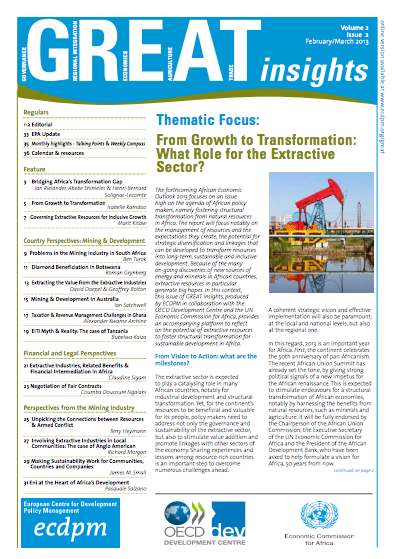 GREAT Insights, Volume 3, Issue 4. April 2014. China’s rapidly growing economic presence in Africa is often followed with suspicion. A clearly visual presentation of the trade flows to China could improve statements about China’s imports from Africa. In the past decade, China’s total imports from Africa has grown rapidly from US$5 billion in 2002 to US$113 billion in 2012. (1) According to the African Economic Outlook Report 2011 (2), China surpassed the United States (US) in 2009 as Africa’s single major country trading partner. However, that is when export and import flows are added. When only the export flows from Africa are taken into account, African countries together exported almost US$20 billion more to the US than to China in 2009. (3) According to International Trade Centre (ITC) statistics, China only became a larger export destination for the African continent than the US in 2012. What do these statistics tell us, or fail to tell us? First of all, because these rankings are based on the total trade with Africa, it does not necessarily mean that the highest- ranking country is the main trading partner for most African countries. For example, in 2012 China was the main export destination for just a handful of African countries of which some (especially South Africa and Angola) happen to have a much larger export volume than most other African coun- tries. This made China “Africa’s largest trading partner.”(4) In order to study the actual and relative importance of China as an economic partner for African countries it is necessary to study the trade flows on a country level and to compare the exports to China with the exports to other important export destinations. 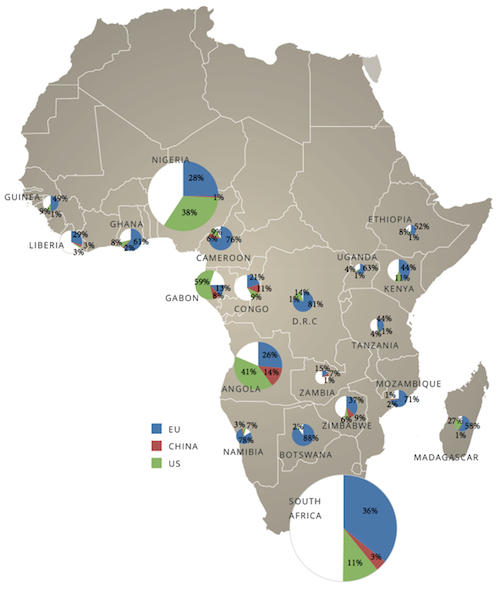 The findings are presented in the form of two maps of Africa with pie charts showing the share of exports to China, the US and the EU. This preliminary study is meant as the start of a larger project with ECDPM during which African trade flows will be mapped and compared. 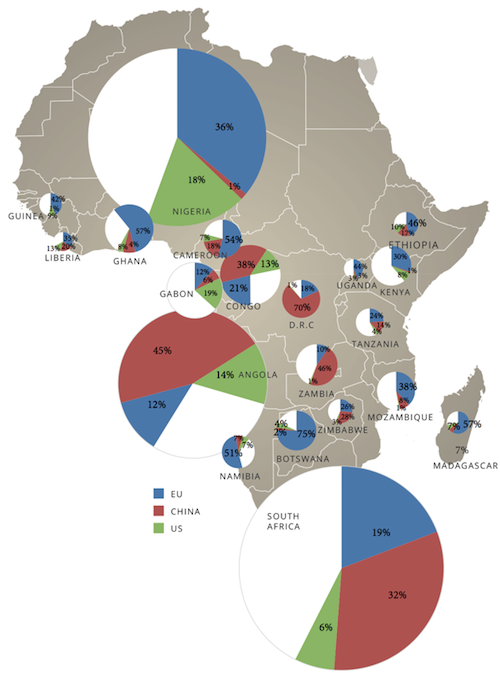 Visualising African trade flows and the relative importance of important export destinations is believed to contribute to improv- ing the research on the relative importance of China and other emerging economies as economic partners for Africa. These visualisations allow, for example, for quicker assess- ments of the role of a specific economic partner for specific African countries. While the upcoming project will include both import and export flows, the focus of this article is on export flows only. Currently, several maps exist showing the total exports to China per country for a certain year. These maps show the importance of specific African countries for China as source countries; however, they do not show the relative importance of China as an export destination for these African countries. Another more recent map shows whether China is the main, second, third or lower trading partner per African country (6). This gives a better idea about the importance of China as an export destination; however it does not give a clear picture about the other main export destinations and whether China’s share is much larger or smaller than the shares of these other key importers. 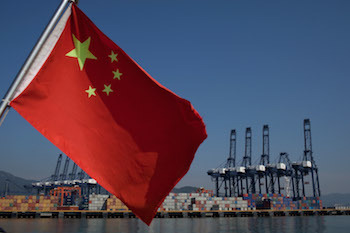 While China reported to have imported US$44 billion from South Africa, the South African authorities reported to have exported only US$10 billion to China. With the planned project we aim to provide information about the relative importance of the main importers from and exporters to Africa on a country level; both in general and per economic sector. The main questions that will be answered in this article are: how important is China as an export destination for the selected African countries? How does China’s interest in certain countries and products com- pare to the interests of two other key export destinations, namely the EU and the US? For this preliminary study 20 sub-Saharan African countries were selected on the basis of the importance of China as an export destination or the sometimes surprising unimpor- tance of China as an export destination. Figure 1 shows the share of exports to China (red), the US (green) and the EU (blue) for the selected 20 countries for 2002 and Figure 2 shows the share of exports to China, the EU and the US for 2012. The maps clearly show that from a marginal player in 2002, China became the largest export destina- tion for the Democratic Republic of Congo (DRC), Zambia, Angola, Congo, South Africa and Zimbabwe in 2012. Table 1 shows the main products that were exported from these countries to China in 2012. For the DRC, exports to China consist mainly of copper and, to a lesser extent, crude oil and cobalt. Zambia’s exports to China are dominated by copper. For Angola and the Congo exports to China consist almost completely of crude oil. For South Africa the data from the ITC Trade Map is rather unsatisfactory because 65% of exports to China are referred to as “commodities not elsewhere specified”. It is interesting to note that only China reports this trade flow in “commodities not elsewhere specified”. While China reported to have imported US$44 billion from South Africa, the South African authorities reported to have exported only US$10 billion to China. If we do not take into account this large mysterious trade flow, iron counts for 35%, platinum for 14%, coal for 10% and diamonds for 9% of exports to China. This shows that China’s imports from South Africa are more diverse than from the other African countries. Another sub-Saharan African country for which China was an important export destination in both 2002 and 2012 is Sudan. Sudan’s main export product to China is also crude oil. In 2011, South Sudan gained its independence from Sudan. 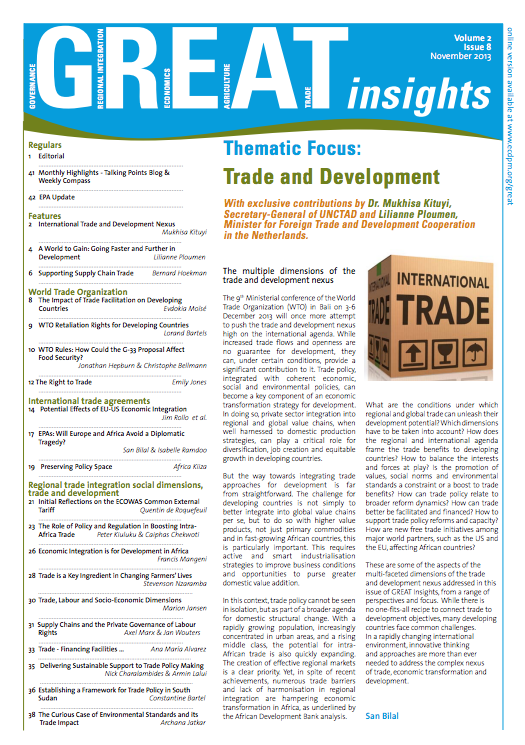 However, the ITC Trade Map still provides only data for Sudan and South Sudan combined. Therefore it was decided to not include data for Sudan for this preliminary study. One might expect a more important role for China as an export destination for Nigeria due to China’s strong interests in crude oil; however China is only a marginal importer from Nigeria. China accounted for only 1% of Nigeria’s exports in 2012. This small share could be explained by the fact that China is a relative latecomer in the oil industry of Nigeria. 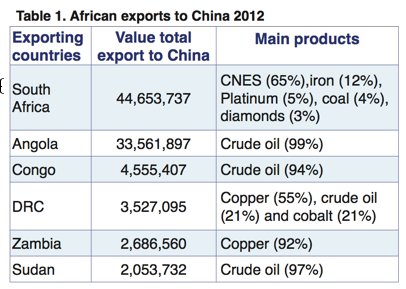 From this data it can be concluded that China is predominantly buying crude oil, copper and iron from Africa. In other words, it is true that China is mainly interested in Africa’s natural resources. However, as I will discuss in more detail in the next paragraph, the data shows that this trend counts even more so for the US and to a lesser extent also for the EU. However, in countries like Zimbabwe, Ethiopia – and some Northern African countries that are not taken into account for this preliminary study – the main export prod- ucts to China are agricultural products such as sesame, tobacco and cotton. The maps per economic sector, which will be published soon on ECDPM’s website, will give a bet- ter picture about which sectors China is most prominent in as an export destination. Figure 1 shows that in 2002, the US was the main export destination for Angola, Nigeria and Gabon. More than 95% of the exports from these countries to the US consisted of crude oil. Ten years later, the US was still the main export destination for Gabon, however the EU became the main export destination for Nigeria and China for Angola. In 2012, crude oil was still the main export product to the US from the African continent. 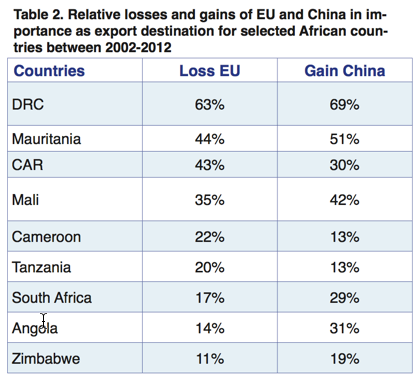 In 2002, the EU was the main export partner for most African countries showed in Figure 1. Only not for the three countries mentioned above – for which the US was the main export partner – and Zambia. The last one exported more to both Saudi Arabia and South Africa than to the EU. 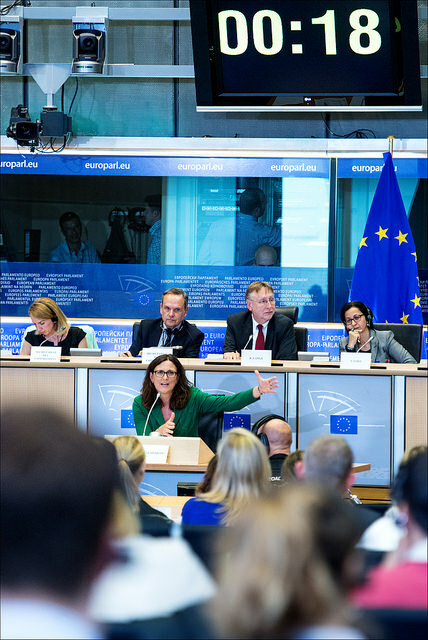 In 2012 the EU was the main export partner for Nigeria, Guinea, Liberia, Ghana, Cameroon, Uganda, Ethiopia, Kenya, Tanzania, Madagascar, Mozambique, Botswana and Namibia. Of the export flows of these countries to the EU, only two were (strongly) dominated by just one EU member state, namely: Botswana to the United Kingdom (UK) and Madagascar to France. The Netherlands was the most important export destination within the EU for the selected countries followed by Spain and Belgium. It can be concluded that China is predominantly buying crude oil, copper and iron from Africa. In other words, it is true that China is mainly interested in Africa’s natural resources. Alex Vines from Chatham House emphasises in his article Thirst for African oil that “[n]ine out of ten of China’s top trading partners in Africa in 2008 were oil producing states, the exception being South Africa”. (9) However, if we look at export flows alone, it appears that China exported mainly oil from only seven out of ten of China’s top source countries in Africa in 2008 while in the same year this was actually nine out of ten for the US. (10) Although these statistics are already relatively old, I believe it is still worthwhile to point out the error in this comment since today’s opinions about the importance of China as an export destination for Africa are based on comments like this published by influential institutes like LSE. For 2012, China exported mainly oil from only six out of ten of China’s top source countries in Africa and the US still nine out of ten. In other words, it is important to make a distinction between import and export flows and to do comparative studies in order to put statements about China’s imports from Africa in the right context. Using statistics from ITC Trade Map 2014 available at www.trademap.org. AfDB, OECD, UNDP, and UNECA. 2011. African Economic Outlook Report 2011: Africa and its Emerging Partners. Ighobor, K. 2013. China in the heart of Africa: Opportunities and pitfalls in a rapidly expanding relationship, Africa Renewal. Available at: http://www.un.org/africarenewal/magazine/january-2013/china-heart-africa. 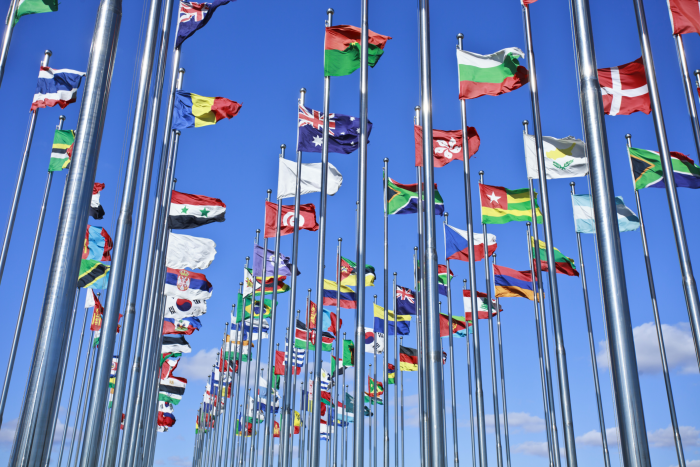 Following the definition of UNCTAD , the data for China in this article do not include those for Hong Kong Special Administrative Region, Macao Special Administrative Region and Taiwan Province of China. Vines, A. 2010. Resurgent continent? : Africa and the world: thirst for African oil. 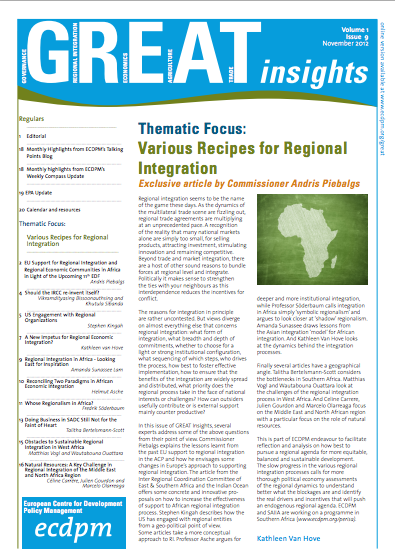 IDEAS reports – strategic updates, Kitchen, Nicholas (ed.) SU004. LSE IDEAS, London School of Economics and Political Science, London, UK. PDF available here. Sanne van der Lugt is an Associate at the African Studies Centre in Leiden and former research analyst at the Centre for Chinese Studies at Stellenbosch University.